I created this Braided Pepperoni and Ham Stromboli based off our hometown Italian restaurant. It is filled with pepperonis, ham, mozzarella, and provolone cheeses. Strombolis come in many shapes, sizes, and flavors. This one was inspired by a local restaurant. I added the braiding for a little something extra instead of the traditional slits for venting. I used refrigerated pizza dough for this recipe. I stretched it out, rolling it thinner than how it comes out of the roll. Starting with pizza sauce, I then layer mozzarella, ham, pepperoni, and topped it off with provolone slices. To create the braid, make even slices on each side of the pizza dough evenly. Tuck top and bottom in and then start pulling pieces of dough, moving from left then right. After the braid is formed, use a pastry brush and spread egg wash over the stromboli. I topped it off with parsley leaves and baked it in the oven for about 16 minutes. This incredibly easy recipe is made in just a matter of minutes. It ready to eat right out of the oven. This recipe tastes great served with this Copycat Pizza Hut Dipping Sauce recipe. We enjoy Pizza Hut sauce but it’s not enough to go around… now I make it at home and it’s easy to make! This stromboli can easily be served by itself as it has meat, cheese, veggies, and bread. It’s pretty much like a pizza! Serving a side salad along with the stromboli and dipping sauce will make it feel more complete. However, when I make it I serve it by itself and it’s more than enough to feed the family. Use rolling pin to roll out pizza crust to make it thinner. In center of crust spread pizza sauce. Layer with mozzarella cheese, pepperoni, ham, and top off with provolone cheese. Cut slits on each side of pizza crust evenly. Tuck in end of stromboli and begin "braiding" the pizza crust from left to right. Use a pastry brush to spread egg wash over prepared stromboli. Sprinkle parsley leaves on dough. Bake for about 16 minutes or until pizza crust is golden brown. Serve alone or with dipping sauce. I love the shortcut of using a refrigerated pie crust. I need all the time saving tips I can get. This is a nice change of pace from pizza. This stromboli is stunning and oh so delicious!! LOVE stromboli! Such a great idea to braid it. Perfect! 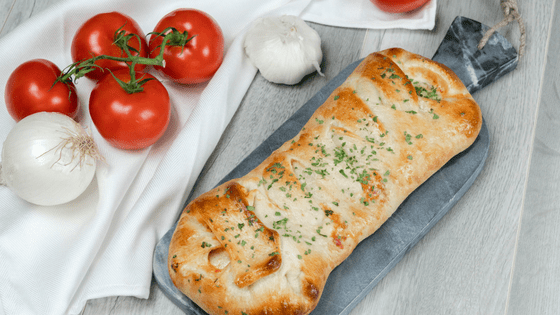 This Stromboli looks like the perfect family meal! My husband and toddler would love this! Yum! I always forget about strombolis. They are so simple and delicious! Bringing this recipe into my family’s rotation. Delicious!